Nazca is the name of a system of valleys on the southern coast of Peru, and the name of the region's largest existing town. It is also the name applied to the Nazca culture that flourished in the area between 300 B.C. and A.D. 800 They were responsible for the famous Nazca lines tour and the ceremonial city of Cahuachi; they also constructed an impressive system of underground aqueducts that still function today. Peru travel Agencyis the perfect choice to enjoy an unforgettable experience. The town of Nazca has recently been dumping its trash on the pampa, destroying some of the Nazca lines in the process. This has caused some controversy; it is believed the mayor issued the order to protest a lack of aid to Nazca. Under President Alberto Ken'ya Fujimori's rule, Nazca received money to turn the irrigation canals into tourist attractions. Unfortunately, this consisted of tearing up some of the access points to the canals and replacing them with reconstructions of how they were believed to have looked. 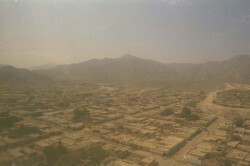 Since 1997 Nazca is the location of a major Canadian gold mining operation. The people who were living on the land for the previous 2000 years did not have title to the land so they were displaced without legal problems. Since then there have been some attempts to legalize poor citizens' ownership of their land and their fixed property, in response to Hernando de Soto's research on the poor. the perfect choice is Peru Accommodations because the hotels Nasca are gorgeous in this travel agency. Nasca Lines and Ballestas islands. from Lima Paracas Reserve, Ballestas Islands tour.